Tonight was July’s Third Thursday, in downtown Joplin. The light rain falling didn’t seem to dampen the enthusiasm of the people walking about, participating in this fun event. I was delighted to see a good turnout, undeterred by the weather. I always enjoy Thirds Thursdays, however tonight, I had a very specific purpose in mind as I strolled down Main Street. 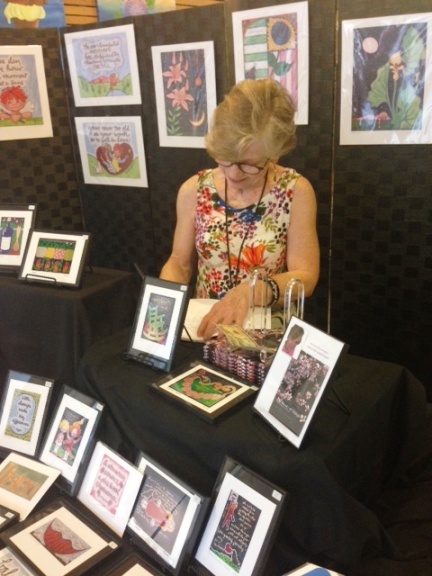 Artist Alice Lynn Greenwood had an exhibit set up at the Post Memorial Art Reference Library and was present at another exhibit located at RSVPaint. I had been looking forward to meeting her. For my first today, I had the opportunity to do so. Born in Little Rock, AR, Alice Lynn earned her art degree from Hendrix College. She moved to New York, with her two children and two cats, to study at the General Theological Seminary and the Art Students League. After her children grew up and left the nest, she returned to AR to care for her aging parents. She remained in AR for 10 years, creating a studio and a life, gardening and painting, active in her community, grateful for the many changes in her life that had guided her. Alice Lynn’s journey most recently brought her to Carthage, MO, where she has set up a studio in an artist cottage beside historic Route 66. Alice Lynn is an artist with an amazing eye for beauty and something somewhat unusual for an artist….a strong love of language and words. Her passions combine to create imaginative, bold works of art that enchant the viewer. I first encountered Alice Lynn’s work through a Joplin Globe article featuring her art and highlighting one of her exhibits downtown. Unfortunately, I didn’t make it to the show. A couple of months later, while eating lunch at Cooper’s, I admired the beautiful paintings hanging on one wall. I was particularly captivated by one that used vibrant, fall colors and contained the words, “Let the beauty of what you do be what you love.” Greg surprised me and bought the painting for me. At home, I looked up the artist online, and realized this was the same gifted woman whose exhibit I had missed. I love how opportunities have a way of coming to us again. I friended Alice Lynn on Facebook. When I posted a blog link and a picture of my vintage suitcase vignette, featuring the art piece I had picked up downtown, Alice Lynn recognized her work and commented. We have enjoyed following each other’s journeys since, via Facebook. It was a privilege and a joy to meet Alice Lynn Greenwood this evening and chat for a few minutes about her art, our journeys and life. 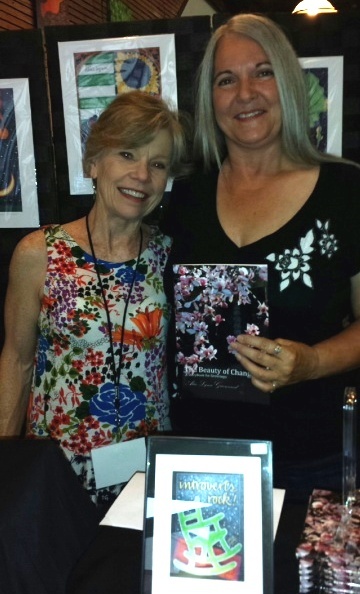 She graciously allowed a picture to be taken of the two of us, and wrote a lovely inscription in her recently published book, “The Beauty of Change”, which I purchased at the exhibit. Alice Lynn not only captures beauty in her artwork, she embodies it. Her book furthers her love of words and art and is an invitation to travel with her through her journey of changes. I accept that invitation and I look forward to Alice Lynn’s continuing journey, captured so brilliantly through her art.